My mate wanted to use the castle to represent a fort in either Gondor or Dol Amroth and as such, there were to be 2 sets of towers for the outer wall which will be interchangable. That list seems very long but in some cases I’ve only used 1 or 2 cast from a certain mould (Ruined Tower Mold #65 for example). These moulds are a very useful tool (if a little expensive to buy at first). With a lot of the blocks cast I set to the design. Its to fit in the corner of their board (approx4’x4′ ), so 60cm x 60cm seemed right. I placed the blocks in several different positions until I was happy then gave the polystyrene base a VERY light spray from over 30cm away with a spray can to show the positions of the blocks without damaging the polystyrene. The excess polystyrene was trimmed away and the MDF base was cut with a small hacksaw. Next polystyrene blocks were glued into place (using PVA) to later form the cliffs around the fort. The first few layers of Hirst Arts blocks were glued into place (using PVA again) untill all the structures were started. The causway up to the front gate was also carved and sanded into shape. A thin layer of Polyfila was spead on the floor to later be carved into a paved courtyard. The cliffs under the outer wall were carved and a layer of Polyfila was again used to give them a more realistic appearance. I cut into the polyfila courtyard to shape the large paving stones. This was done at this stage as it is much easier to use the dremel with the walls at this height (lesson learned from Helm’s Deep). Half the Outer wall is up to the finished height here. I painted the inside of the Keep at this point as I would not be able to do it once the roof was on. I’ve used polystyrene to shape the top of the outer wall. A layer of Polyfila is spread on top and the paving was carved the same way as the floor. The rocks on the cliff were made using Woodland Scenics Rock Moulds. The rocks were held in place using T shaped pins and glued using PVA. Some of the detail around the front gate. At this point the basic fortress is just about finished. Just got some more detail to add on the surrounding cliff-faces, waterfall etc and the painting can begin in earnest. I took a lot of inspiration from Aragorn’s crown for the Gondor details and the owner liked the domes for Dol Amroth (and I agree 100%). And the bonus version… Mordor. The main gates are made using balsa wood, lollypop sticks and cable-ties. They were held in place by working hinges from the local hardware store. The cliffs have been shaped and covered in a layer of Polyfila. I’ve also put a little extra detail on the outer towers to try and blend the square base – round tower join. The basecoat is sprayed onto the fort (making sure that all exposed areas of polystyrene are sealed before this point. Spray cans disolve polystyrene! First layer on the rock faces using diluted Woodland Scenics Stone Gray. The walls are drybrushed with white. The domes were painted white and then washed using GW Shadow Grey. The gate was painted black, then drybrushed with Shadow Grey. The metal bands are Boltgun Metal. The cliffs are washed with Woodland Scenics Green Undercoat next. With a final drybrush of white to the cliff, they were finished. The waterfall was made by cutting a piece of polycarbonate clear sheeting (leftover from building my outdoor bar/pergola area) and glueing it in place with a hot glue gun. I poured the resin water (I use a product called Glass coat from my local Hardware store) down the polycarb waterfall from the top. Woodland Scenics Water Effects was applied over the polycarbonate and smeared into shape using my fingers. Make sure there are no straight edges from the sheeting showing by hiding them with the Water Effects. A Quick drybrush with white and its done. The castle was given a very diluted wash of Woodland Scenics Black to add detail. A few bushes and some long grass tufts were added to the cliffs (plants grow everywhere). The secret path leading from the keep to a cave behind the waterfall was part of the original design and a very interesting feature. The finished fortress – Gondor. This was a complete suprise to the owners and I actually think it’s become my mate’s favourite version of the 3. Here’s the complete piece with all the options (showing how the tops of the towers slot into place). Photos from various angles to show some of the detail. 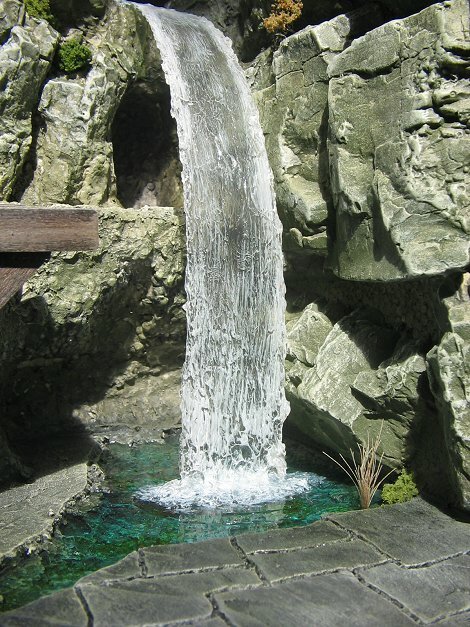 And finally, my favouite part of the build – the waterfall. I really want to thank Matt and Mike for coming up with this excellent design and allowing me to make it for them, so much fun and I see that its already had a lot of use…hope it holds up to the relentless hordes of Uruks and Orcs!